Western blot analysis of whole cell lysates probed with hexokinase 2 antibody (VMA00174) followed by detection with HRP conjugated Goat anti Mouse IgG (1/10,000, STAR207P) and visualized on the ChemiDoc™ MP with 32 second exposure. Arrow points to hexokinase 2 (molecular weight 102 kDa). Hexokinase 2 antibody recognizes hexokinase 2, also known as HK2 or hexokinase type II. This antibody has been extensively validated for western blotting using whole cell lysates. Mouse anti Human hexokinase 2 antibody recognizes hexokinase 2 (HK2), also known as HK II, hexokinase type II and muscle form hexokinase. Hexokinases phosphorylate glucose to produce glucose-6-phosphate, the first step in most glucose metabolism pathways. Hexokinase 2 is the predominant form found in skeletal muscle. It localizes to the outer membrane of mitochondria. Expression of HK2 is insulin-responsive, and studies in rat suggest that it is involved in the increased rate of glycolysis seen in rapidly growing cancer cells (provided by RefSeq, Apr 2009). 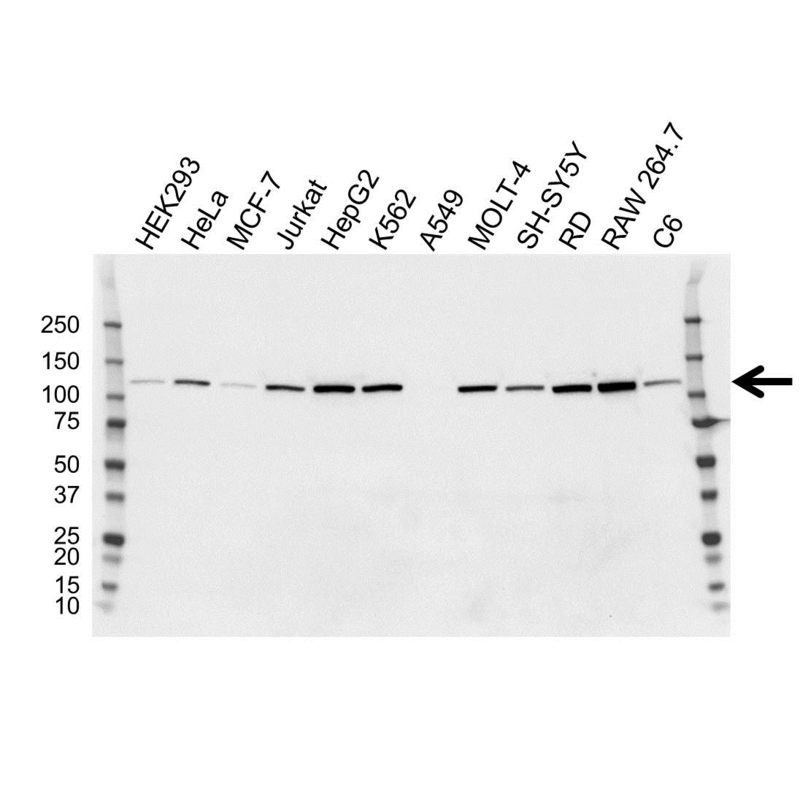 Mouse anti Human hexokinase 2 antibody detects a band of 102 kDa. The antibody has been extensively validated for western blotting using whole cell lysates. Anti hexokinase 2 detects a band of approximately 102 kDa in K562 cell lysates. Full length recombinant human hexokinase 2 (NP_000180) produced in HEK293T cell.